Happy Australia Day to all of our friends from down under! Particularly our dear friend Graham, who has helped counsel me on many a web development issue as our web site has grown. Additionally, Graham claims, Vegemite is great for a hangover, because it has “the highest source of Vitamin B in a food product.” That would come in handy for E, who would crawl out of bed late this morning because he had too much wine last night. For both reasons, today seemed like the perfect day for a Vegemite sandwich. I dug out the Vegemite from our cupboard, toasted an English muffin (I know, goes against the whole Aussie theme, but it was as close to white bread as I had on hand this morning), and smeared butter on one side, Vegemite on the other. I omitted the cheese because I wanted the pure Vegemite taste to come through as much as possible, so as to give it a the fairest evaluation of flavor as possible. When E strolled out of the bedroom—wearing his Sunday uniform, the white terry cloth robe—I handed him half of the sandwich. “Is this what I think it is?” he asked. The rest of the sandwich sat on the plate. E then made scrambled eggs to help him nurse his hangover. I took a bite. I felt like I had eaten a salt lick. I then grabbed some of those scrambled eggs and rinsed it down with black coffee. Maybe I should try it more as a condiment then as a base. 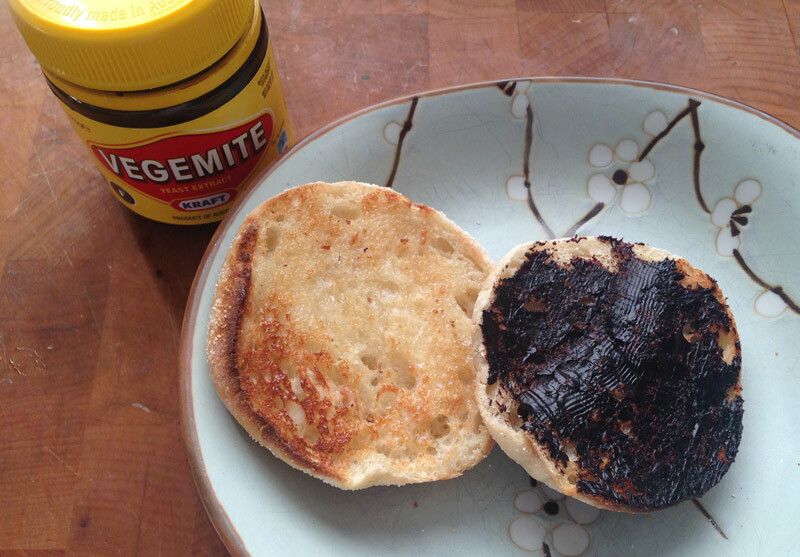 Aussie friends, how do you use Vegemite on a sandwich? Send me your suggestions in the comments below or on our Facebook page! I followed precisely. The results? Much better.